If you have a nature-loving reader on your gift list, you might consider buying the small but fascinating A California Bestiary, written by Rebecca Solnit and illustrated by muralist Mona Caron. In conjunction with the Oakland Zoo and their renewed attempts to highlight native species, this book was inspired by medieval bestiaries and works to bring the magic and majesty back to our view of California's species, both thriving and endangered. This book highlights one dozen fascinating animals including the California condor, the Elephant seal and the Monarch butterfly. Sadly, it also presents one animal that has already been driven to extinction -- the California grizzly, the animal on the state flag and state seal. The first thing I noticed about this book was that the illustrations are detailed but don't feel "scientific". They aren't the illustrations of Audubon but instead have a slightly more fictional feel. The outlines are dark, the colors are brilliant and the backgrounds are simple. And yet I definitely feel that I would recognize these animals in the wild. The text also has a more informal feel -- more like a journalistic essay than a stodgy paper. There are facts (presented in sentence form, not bullet-pointed lists) but also first-person anecdotes that really make this a fun read. My degree is in zoology so I've definitely read my share of dull animal papers! And even I learned some fascinating new animal facts from this book and have a greater appreciation for these creatures of my birth state. 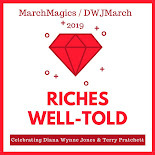 This book will release in April. 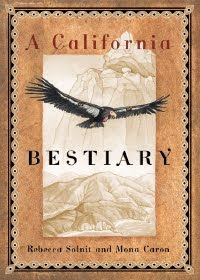 Support our site and buy A California Bestiary on Amazon or find it at your local library. We viewed an electronic galley copy. So sad about the California grizzly. I hate hearing stuff like that. So depressing. But this sounds like a neat idea for a book! I got the Little One a medieval beastiary out of the library and scared him badly ... there were some really weird creatures in it!! I guess I didn't think that one through too well! I almost said that this book was appropriate for middle graders but then I hit one partial sentence that I didn't want parents to freak out at me about ... they referenced bears as symbols of many things including "a gay subculture". I can't imagine passing this book on to a ten-year old and having them ask their mom what that means! There's nothing scary in this one though so that's a plus.